Hog Hollow Country Lodge is secluded on the edge of indigenous forest at The Crags, overlooking a rugged gorge. It’s a paradise for nature people, and a mere 18 kilometres away from Plettenberg Bay. 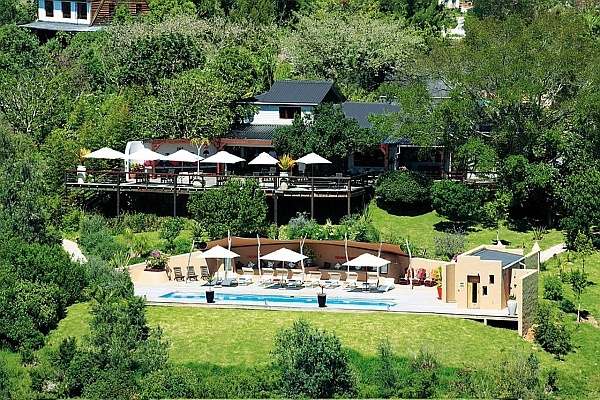 The lodge and its separate 3-bedroom villa offer breathtaking vistas of fertile valleys and the Tsitsikamma Mountains. Ideal for easy-going luxury living and re-connecting with nature’s abundance, the lodge has wonderfully comfy spots for downtime, both in- and outdoors. Sixteen suites have private decks with hammocks, king-sized beds, lounge areas and en-suite bathrooms, and most have fireplaces. Dining at Hog Hollow is congenial, with copious meals served around a communal table, or privately if preferred. Walk on the property, horse ride from the lodge and delight in the Garden Route’s countless offerings. There's currently no specials at Hog Hollow Country Lodge. There are no formal conference facilities at Hog Hollow.